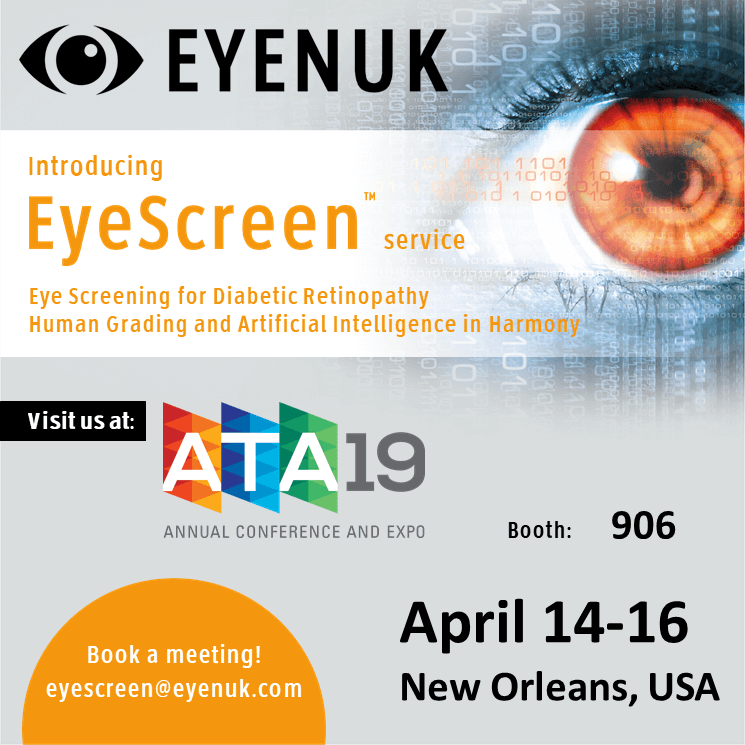 Combining the high accuracy of AI disease detection with the accepted practice of human grading, the EyeScreen™ Service for diabetic retinopathy (DR) identifies cases of referable DR in any clinical setting with extremely high accuracy. This new service will be launching at this year’s ATA meeting in New Orleans. The EyeScreen™ Service is designed to increase access to DR screening, reduce wait times, and improve patient compliance on receiving necessary screenings. Improved patient compliance and more screenings can lead to higher HEDIS scores and improved CMS Five-Star quality ratings. By offering DR screening in their clinics, physicians can identify silently progressing DR sooner and begin intervention faster. This improves patient outcomes and reduces the incidence of vision loss due to DR. Health care providers and systems will also likely save on the cost of treating severe DR by identifying and intervening sooner. Come see how the EyeScreen™ Service can change the way you screen for DR at Booth # 906. The EyeScreen™ Service uses both a validated AI disease detection system and specialist human graders to assess retinal images. After these images are independently assessed by both the AI disease detection system and human graders separately, an ICD10 compliant report is sent to the physician. In the event that the AI and human graders disagree, the images are adjudicated by a highly experienced human expert.